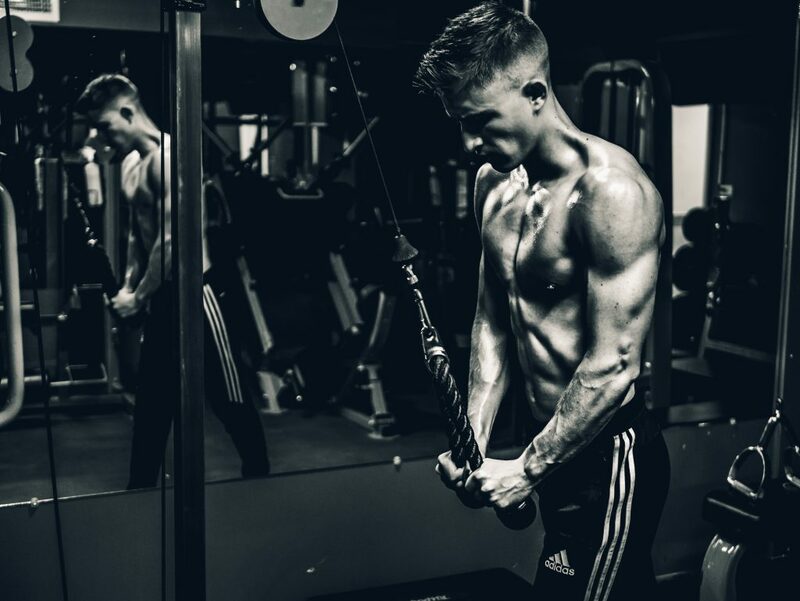 Branched Chain Amino Acids (BCAAs) are a well-loved sports supplement that are taken by bodybuilders, fitness models, and casual gym goers alike as a peri-workout (something you take during a workout rather than before or after). BCAAs are made up of three essential amino acids: Leucine, Isoleucine, and Valine. They are considered essential because the body cannot make them itself. Therefore, it is important to get them from your diet, or via supplementation. Such supplements are often sold as a ratio of 2:1:1 – 2 parts Leucine, 1 part Isoleucine, and 1 part Valine. This is known as the golden ratio, and most studies into the effects of BCAAs use it. So, what are the benefits of BCAAs and why should you be taking them? BCAAs are promoted as great for fuelling protein synthesis and therefore building muscle. Research demonstrates that BCAAs, leucine in particular, do indeed activate enzymes responsible for muscle-building, though some experts suggest you may only notice a significant benefit if your dietary protein intake is quite low in the first place. Here’s a scenario when BCAAs can benefit almost everyone, however… during early morning training. If you head to the gym early in the morning, for instance, and miss breakfast, you can end up training in a fasted state. Taking a BCAA supplement during or after your workout can help to stimulate protein synthesis immediately after your workout. BCAA supplements are great at reducing fatigue. When training, fatigue can slow your training down to a crawl, particularly if you are training every day or if your sleep has been interrupted the previous night. Both physical and mental fatigue can affect your workout. A 2011 study by Wisnik et al found that taking BCAAs before running on a treadmill led to a preservation of cognition (how well the subjects were able to think) during the latter stages of the session. This demonstrates the benefits of BCAAs for sports where you need to be able to think and make decisions while tired (so basically all sports). A study in 1997 by Blomstrand et al looked at the effects of BCAA supplementation on the rate of perceived exertion during exercise. Rate of Perceived Exertion (RPE) is a measure of how difficult you think an exercise is while you are performing it. Imagine lifting your personal best on the bench press while in the gym feeling the best you’ve ever felt. Now imagine lifting that same weight while exhausted after only 4 hours of sleep. The weight is the same, the requirement is the same, but it would almost certainly feel a lot more difficult. This is your RPE. The study found that taking 90mg/kg of bodyweight (so a 100kg person would take 9g) led to a significant drop in the rate of perceived exertion during a cycling exercise. Muscle soreness is common for a day or two after an intense workout, especially if the exercise is new. There’s significant evidence to suggest increasing your BCAA intake can help to reduce that pain. There are several studies that demonstrate how BCAAs can decrease protein breakdown during a workout, simultaneously reducing the levels of creatine kinase, a sign of muscle damage. Other studies have found that reaction time can be sped up, and aerobic exercise can be improved by taking BCAAs during or before a workout. A lot of BCAA supplements (some of which are reviewed here) have been jazzed up by including other complimentary ingredients. But sometimes it is nice to review a supplement that does exactly what it says it does without any bells or whistles. Performance Lab SPORT BCAAs contains just Leucine, Isoleucine, and Valine in the golden ratio (1500mg: 750mg: 750mg). Nothing else. This is a high dose of each branched-chain amino acid, and it comes from a quality natural source (fermented from Sunflower lethicin), making the BCAAs highly bioavailable. 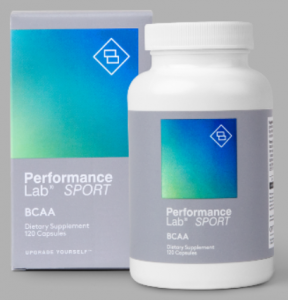 Performance Lab SPORT BCAA is a pure product: as well as its all-natural form of amino acids, it is GMO, soy, gluten, additive and allergen-free, as well as being vegan-friendly. If you are looking for a high quality BCAA supplement that doesn’t waste a second on any other ingredients and concentrates instead on purity and potency, then this is the supplement for you. 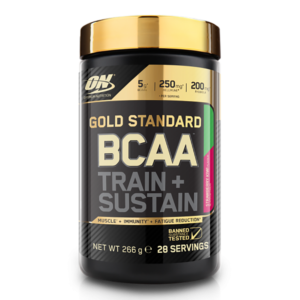 On the complete opposite end of the spectrum we have Gold Standard BCAA Train & Sustain from the ever-popular Optimum Nutrition. This supplement is not only aimed at improving gym performance, it is also designed to boost your immune system – something that anyone who trains at a high intensity for weeks on end should consider. There are 5g of BCAAs within this supplement (2.6g Leucine, 1.2g Isoleucine, 1.2g Valine) but ON have also added Rhodiola Rosea which is a fantastic supplement for boosting cognition, reducing fatigue, and improving mood. There is also a large dosage of Vitamin C, which should help to slightly reduce the severity of a cold, and a proprietary blend called Wellmune. All in all, a great supplement. Which is something we have come to expect from Optimum Nutrition. 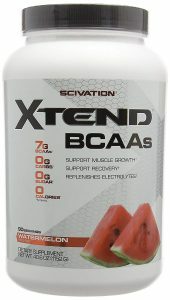 Scivation Xtend BCAA powder is a personal favourite of mine. It contains 7g of the usual Leucine, Isoleucine, and valine in the 2:1:1 ratio. But it also contains Glutamine which has been shown to increase exercise capacity during endurance exercise. This fits in really well with the anti-fatiguing properties of the BCAAs. There is also an electrolyte blend which will help you while you train as you lose a lot of electrolytes through sweat. Scivation have really thought about what people need from a peri-workout supplement. Finally, there is Citrulline Malate, which can help to reduce fatigue, reduce muscle soreness, and boost nitric oxide – meaning faster deliver of oxygen and nutrients to your muscles during a workout. This is a truly great BCAA supplement, that really has thought of everything. Finally, we have a BCAA powder from the Protein Works. Like Performance Lab SPORT BCAAs this is a supplement that prides itself on being a high quality BCAA supplement and nothing else. The main difference between the two is that the former comes in capsules while the latter comes as a powder (with flavoured or unflavoured options). Really this comes down to personal preference. If you don’t mind taking capsules then Performance Lab SPORT is the way to go, but if you prefer drinking your BCAAs then this is an excellent supplement at a bargain price per serving. So, there you have it, four excellent BCAA supplements that are all available to buy in the UK. 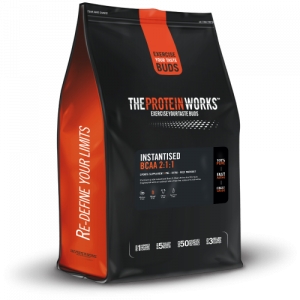 I’ve gone for two unadorned versions (Performance Lab and The Protein Works) and two upgraded versions (Scivation and Optimum Nutrition). Any of these supplements will be perfect for reducing fatigue, reducing the rate of perceived exertion, and boosting your training performance overall. All you need to do is decide which one suits your needs best.